The Control Room during a shooting of CUTV News Center. 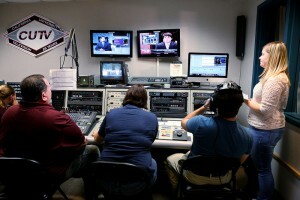 CUTV’s in-studio operations include the fully-functional television production studio and control room, including a news set with a 60″ HD Monitor screen, a sports interview set, greenscreen equipment, a recently renovated master control room featuring a switcher, COMPIX Graphics technology, an EZNews teleprompter system, as well as tape and audio controls. The studio also has the ability go live-to-air from the Master Control booth. CUTV keeps well-maintained equipment including Mini-DV and DVCPro cameras in the Equipment Room for student use, as well as a full-range of lighting and audio equipment to suit almost every scenario. Students running cameras in the studio during a shooting of CUTV News Center. CUTV’s Editing Suite features multiple non-linear editing stations in the post-production room. Our editing suites come equipped with Final Cut Studio 7, the Adobe CS5 Creative Suite, Zaxwerks 3D Software, all aboard Mac Pro desktop hardware featuring Intel Xeon Processors. Webpage Created By Adam Lucia of California University of Pennsylvanias, MAC Lab. Webpage Created By Adam Lucia of California University of Pennsylvania, MAC Lab.